Provide comfort for the family of Margaret (Peggy) Brescia with a meaningful gesture of sympathy. 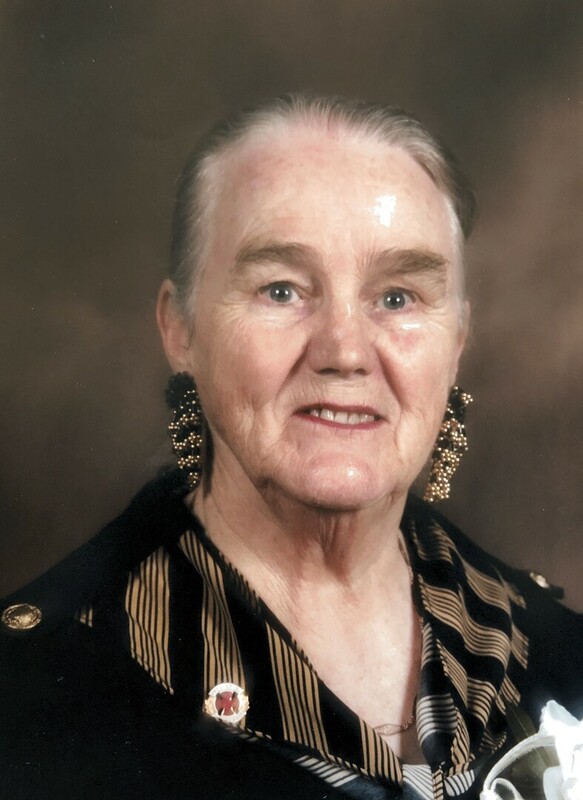 At 93 years of age, Peggy (Margaret) Brescia passed away peacefully in the early morning on March 23, 2019 at Bethammi Nursing Home, Thunder Bay. She was born in New Waterford, Nova Scotia, daughter of Michael and Annie MacMullin. It was on the east coast during the war time effort that she met, fell in love with and married Joseph (Genero) Brescia. The couple moved to Thunder Bay where together they built a new home on Rupert Street and raised a family of six children – Peggy is one of the last icons to depart from this wonderful neighbourhood. She was a bright, vibrant woman known about town for her long signature braid and remembered by all who met her. Peggy loved being together with family and friends. She enjoyed music, reading, baking and playing cards and games. She especially loved children and always encouraged them to sing. While working in her kitchen Peggy enjoyed watching all types of sporting events. In addition, she enjoyed engaging in healthy discussions during family dinners. Peggy believed life should be lived in full. She also believed in contributing by working to help others and remaining in touch with everyone. Peggy was devoted to her church and was a dedicated choir member at Corpus Christi for many years. She was President of the CWL and a life member. She was a life member of St Joe’s auxiliary and worked the Tuck Shop at St. Joseph Hospital for over 65 years. Peggy was also instrumental in fundraising for the Heritage Foundation. She chaired Christmas Cheer campaigns and was an honoured recipient of the Thunder Bay Spirit Award recognizing her contributions to the community. Peggy will be lovingly remembered by her husband of 74 years Joseph Brescia (98 years), by her children Bob (Shelagh), Sheila, Ron (Linda), Vincent (Rose), Joseph (Wendy), Roderick (Connie deceased); her grandchildren David (Laura), Michael (Merrill), Nicholas, Katherine, Joseph; her great-grandchildren (Shawn, Kaitlyn, Kyle, Madden, Luca) and many friends and neighbours. Peggy is predeceased by her siblings Catherine, Rodena, Mary, Effie, Katie, Roddy and Frankie. Our family would like to thank the staff at Bethammi who knew and loved Peggy for all of their kindness and support. A Funeral Mass will be held on Friday, March 29, 2019, 10:30 am at Corpus Christi Catholic Church on Red River Road. Interment to follow in St. Andrew’s Cemetery. Should friends desire, memorial donations to the St. Joseph’s Foundation of Thunder Bay or the charity of one’s choice would be appreciated. Arrangements entrusted to the Sargent & Son Funeral Chapel, 21 N. Court Street. On-line condolences may be made at www.sargentandson.com. To send flowers to the family of Margaret (Peggy) Theresa "Peggy" Brescia, please visit our Heartfelt Sympathies Store. Donations are being accepted for: St. Joseph's Foundation. We encourage you to share any memorable photos or stories about Margaret (Peggy). All tributes placed on and purchased through this memorial website will remain on in perpetuity for generations. Douglas Fenwick, Jim Murphy, and others have sent flowers to the family of Margaret (Peggy) Theresa "Peggy" Brescia. Dear Joe and all your children, You have my sincere condolences. I remember Peggy as a great lady, always smiling and laughing, just like you Joe. There are so many great stories around your home and at our cottages/camp. Peggy always sang in the church choir and I loved hearing her sing at home and the cottages = 'camps'. She will be greatly missed by many. There will be a wonderful reception awaiting her including my parents. Love to you all Janet Groulx & Graeme Chalmers, and Christopher, Dave, Briana and Chase. Heartfelt sympathies to Joe and all the Brescia family.